Malthusianism and eugenics were far from unpopular ideas in the last quarter of the nineteenth century. Many prominent figures who are considered liberal by today’s standards endorsed parts of the underlying rationalizations. By the turn of the century there was talk of race suicide, that not-so-subtle claim that by admitting foreigners and the poor, the country was in danger of losing its superior stock — the Northern Europeans. The term first appeared in print in 1901, when a speech given by sociologist and eugenicist Edward Ross was published. For a case like this I can find no words so apt as “race suicide.” There is no bloodshed, no violence, no assault of the race that waxes upon the race that wanes. The higher race quietly and unmurmuringly eliminates itself rather than endure individually the bitter competition it has failed to ward off from itself by collective action. The working classes gradually delay marriage and restrict the size of the family as the opportunities hitherto reserved for their children are eagerly snapped up by the numerous progeny of the foreigner. The prudent, self-respecting natives first cease to expand, and then, as the struggle for existence grows sterner and the outlook for their children darker, they fail even to recruit their own numbers. It is probably the visible narrowing of the circle of opportunity through the infiltration of Irish and French Canadians that has brought so low the native birth-rate in New England. Ross, Edward A. “The Causes of Race Superiority.” Annals of the American Academy of Political and Social Science 18 (1901): 67–89. This line of reasoning provided those who campaigned against birth control with argument they could present to the public, as President Theodore Roosevelt did with some enthusiasm. Early malthusian arguments are to be found in the work of Charles Loring Brace, who is celebrated as an early pioneer of children’s welfare and rights. Taken to an extreme, malthusianism led to eugenics. Actual policies based on eugenics began in the U.S. in the early nineteenth century and extended to forced and coerced sterilization of the mentally ill. 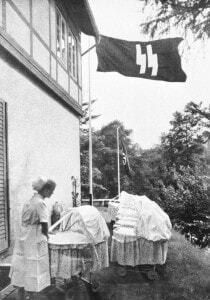 The popularity and scientific acceptance of eugenic theory began to decline with its use as a foundation for Nazi racial policies and the Holocaust. Brace, Charles Loring. The Dangerous Classes of New York and Twenty Years’ Work among Them. New York: Wynkoop & Hallenbeck, 1872. Gordon, Linda. The Moral Property of Women: A History of Birth Control Politics in America. University of Illinois Press, 2002. Pernick, M S. “Eugenics and Public Health in American History.” American Journal of Public Health 87.11 (1997): 1767–1772. aphapublications.org (Atypon). Ross, Edward A. “The Causes of Race Superiority.” Annals of the American Academy of Political and Social Science 18 (1901): 67–89. A social theory discussed in the novel in connection with the purpose of the [[orphan trains]]. Text from Wikipedia, citations and some links intact. Malthusianism is a school of ideas derived from the political/economic thought of the Reverend Thomas Robert Malthus, as laid out in his 1798 writings, An Essay on the Principle of Population, which describes how unchecked population growth is exponential while the growth of the food supply was expected to be arithmetical. Malthus believed there were two types of “checks” that could then reduce the population, returning it to a more sustainable level. He believed there were “preventive checks” such as moral restraints (abstinence, delayed marriage until finances become balanced), and restricting marriage against persons suffering poverty and/or defects. Malthus believed in “positive checks”, which lead to ‘premature’ death: disease, starvation, war, resulting in what is called a Malthusian catastrophe. The catastrophe would return population to a lower, more “sustainable”, level. The term has been applied in different ways over the last two hundred years, and has been linked to a variety of other political and social movements, but almost always refers to advocates of population control. Neo-Malthusianism generally refers to people with the same basic concerns as Malthus, who advocate population control programs, to ensure resources for current and future populations. In Britain the term Malthusian can also refer more specifically to arguments made in favour of preventive birth control, hence organizations such as the Malthusian League. Neo-Malthusians seem to differ from Malthus’s theories mainly in their enthusiasm for contraception. Malthus, a devout Christian, believed that “self-control” (abstinence) was preferable to artificial birth control. In some editions of his essay, Malthus did allow that abstinence was unlikely to be effective on a wide scale, thus advocating the use of artificial means of birth control as a solution to population “pressure”. Modern “neo-Malthusians” are generally more concerned than Malthus was, with environmental degradation and catastrophic famine than with poverty. Many critics believe that the basis of Malthusian theory has been fundamentally discredited in the years since the publication of Principle of Population, often citing major advances in agricultural techniques and modern reductions in human fertility. Many modern proponents believe that the basic concept of population growth eventually outstripping resources is still fundamentally valid, and “positive checks” are still likely in humanity’s future if there is no action to curb population growth. Malthusian terms can carry a pejorative connotation indicating excessive pessimism, misanthropy and/or inhumanity. Some proponents of Malthusian ideas believe that Malthus’s theories have been widely misunderstood and misrepresented; these proponents believe his reputation for pessimism and inhumanity is ill deserved. Malthusian ideas have attracted criticism from a diverse range of differing schools of thought, including Marxists and socialists, libertarians and free market enthusiasts, social conservatives, feminists and human rights advocates. “Throughout the Potato Famine years, nearly a million Irish arrived in the United States. Famine immigrants were the first big wave of poor refugees ever to arrive in the U.S. and Americans were simply overwhelmed. Upon arrival in America, the Irish found the going to be quite tough. With no one to help them, they immediately settled into the lowest rung of society and waged a daily battle for survival…. 75 percent of the Irish coming to America landed in New York. In 1847, about 52,000 Irish arrived in the city which had a total population of 372,000. The Irish were not the only big group of immigrants arriving. A substantial German population totaling over 53,000 also arrived in 1847. Immediately upon arrival in New York harbor, they were met by Irishmen known as ‘runners’ speaking in Gaelic and promising to ‘help’ their fellow countrymen. Many of the new arrivals, quite frightened at the mere prospect of America, gladly accepted. Those who hesitated were usually bullied into submission. The runner’s first con was to suggest a good place to stay in New York; a boarding house operated by a friend, supposedly with good meals and comfortable rooms at very affordable rates, including free storage of any luggage. The boarding houses were actually filthy hell-holes in lower Manhattan. Instead of comfortable rooms, the confused arrivals were shoved into vermin-infested hovels with eight or ten other unfortunate souls, at prices three or four times higher than what they had been told. They remained as ‘boarders’ until their money ran out at which time their luggage was confiscated for back-rent and they were tossed out into the streets, homeless and penniless. During the entire Famine period, about 650,000 Irish arrived in New York harbor. All incoming passenger ships to New York had to stop for medical inspection. Anyone with fever was removed to the quarantine station on Staten Island and the ship itself was quarantined for 30 days. But Staten Island was just five miles from Manhattan. Runners were so aggressive in pursuit of the Irish that they even rowed out to quarantined ships and sneaked into the hospitals on Staten Island despite the risk of contracting typhus. Another way to take advantage of the Irish was to sell them phony railroad and boat tickets. Runners working with ‘forwarding agents’ sold bogus tickets that had pictures of trains or boats the illiterate immigrants wished to board to leave Manhattan for other U.S. cities. The tickets were either worthless, or if they were valid, had been sold at double the actual price or higher. On the boats, the immigrant were shoved into jam-packed steerage sections, although they thought they had paid for better accommodations. Sometimes, halfway to their destination, they were told to pay more or risk being thrown overboard. 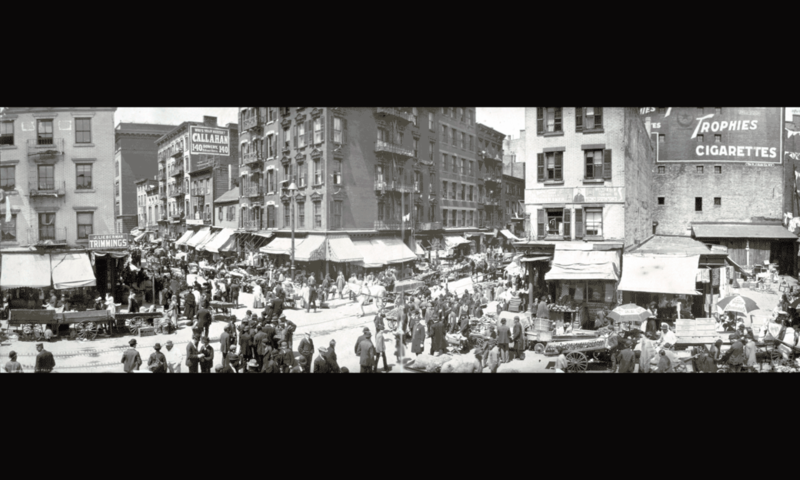 Poverty breeds crime in any population, and 19th century New York city had very poor communities of all ethnicities. The nativist Know-Nothing gangs went to war with the Irish gangs, the Irish rioted and attacked African Americans. They quickly gained a reputation for violence, alcoholism, and slovenly behavior. And the Irish were Catholic, which provided another reason to fear them. The melting pot is represented here as something not just desirable, but necessary. All the other immigrant groups go along with assimilation, but the Irish cause trouble: they refuse to give up their ethnicity, and rebel openly. The character on the room of the pot holds a knife and an Irish flag. The majority of political cartoons about the Irish published by Puck Magazine were far more derogatory, including some of the caricatures of the Irish as brutish – even simian — in behavior and appearance, prone to violence and immoral behavior, and always on the prowl for a way to take advantage of the sweet and innocent. Below are details from the front cover images of two issues of Puck (May 1883, June 1884). It should also be noted that by 1883 the Irish communities were well established enough to gain some political power. They dominated in the police department, and were gaining influence in government more generally.